Lleida is located in the western end of Catalonia and is the capital of the same named province. It has nearly 140,000 inhabitants, but its influence covers a wide area, 300.000 people strong, between Barcelona and Zaragoza. The city plays an important role as a regional centre for communications, commerce and services. As in many other Spanish cities, in Lleida the recovery of local democracy in 1979 marked a dramatic turning point in local politics and policies. The political trajectory of the city since that moment meets the criteria set up by Dowding (2001: 14) to identify an urban regime. It has had a distinctive political agenda, based on the growth, modernisation and enhancement of the city, in force for longer than three decades, sustained by a coalition of local interests attracted by the prospect of growth and subsequent distribution of material and symbolic goods. The two social-democratic mayors who have led the urban regime over the past three decades can show an impressive record of urban transformation and continuous electoral support. Citizen participation has had a role in this strongly presidential scenario, but always a secondary one. From the onset it was understood as civic activation and structured through a range of bilateral (and often not transparent) deals between the municipality and the organizations of the civil society. Later it got additional meanings, such as the transfer of information on government policies and projects, the mediation between actors in conflict and the coordination between formal and informal activities. Between 2003 and 2007, when the Mayor had to look to his left for support for re-election, citizen participation policies were strongly formalized, through an specific ordinance and a range participatory councils. At the end of the day it has been an essentially instrumental approach to participation, not necessarily at odds with progressive policies. An example of this would be the council-led creation of a network of public and private organizations caring for basic social needs. Apparently, the crisis started in 2008 has not substantially affected the overall design of the citizen participation policy, although its budget has been cut. For its part, the council’s opposition has repeatedly asked for more transparency, but it hasn’t proposed any alternative discourses or practices in this area. The topic has come to the fore thanks to the initiatives of parties and social movements from the radical left, such as the demand (and subsequent celebration of) of public hearings or the use of new media and social networks to bring more transparency and critical inputs into local politics. 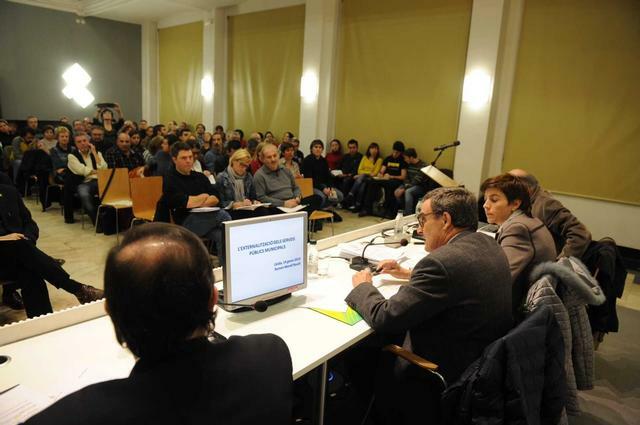 Faced with growing discontent with the excessive formalism of participatory networks and its control by a limited number of self-selected actors, the city leadership has started conveying the idea that, in any plausible future scenario, local governance will have to be exercised hand to hand with the social movements. Although urban protest movements are still notoriously weak and fragmented, the crisis context could indeed open a window of opportunity for a more transparent, accountable and participative model of local governance.